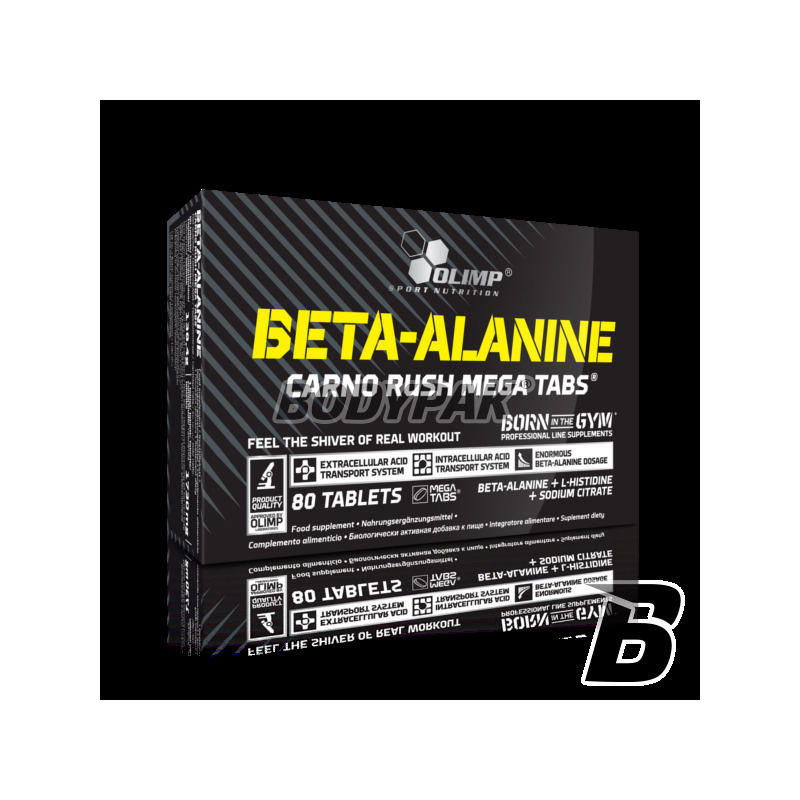 Beta-AlanineOlimp Beta-alanine Carno Rush Mega Tabs - 80 tabl. OLIMP Beta-alanine Carno Rush is a food supplement targeted to those sports endurance-strength, power and endurance, which require high physical performance maintained for a long period of time and / or high frequency training. OLIMP Beta-alanine Carno Rush Mega Caps contributes to a longer time to reach the fatigue so that the actual volume of training may be much higher. Giving beta-alanine and L-histidine is provided at the same time the two components required for the synthesis of carnosine that exhibits the enormous potential antioxidant and may delay the degradation processes occurring in the cell during intensive. Concomitant administration of both substances rule out the risk of deficiency arising from dietetic errors, which may result in a reduced level for a significant effort carnosine. The preparation uses components that ionized form a buffer system of blood, allowing the efficient transport from the muscle cells into organs excreting waste products, including the acid H + ions, in large quantities produced during exercise, and inhibited the rate of regeneration effort adaptation and growth muscles. Ingredients Beta-alanine Carno Rush included in ionized form in the blood buffer system act synergistically in the construction of an efficient system deacidifying the body. Vitamin B6 is involved in the metabolism of amino acids and efficient acquisition of fats and carbohydrates essential substances for subsequent synthesis of ATP. This contributes to the smooth formation of enzymes and hormones, as well as effective operation of the nervous system. In addition, this vitamin increases the efficiency of absorption in the small intestine of the other ingredients. OLIMP Beta-alanine Carno Rush shows a possible positive effect on reducing some training, acidification of the body and accelerate the removal of acidic ions from the muscle cells after the completion of training during regeneration. 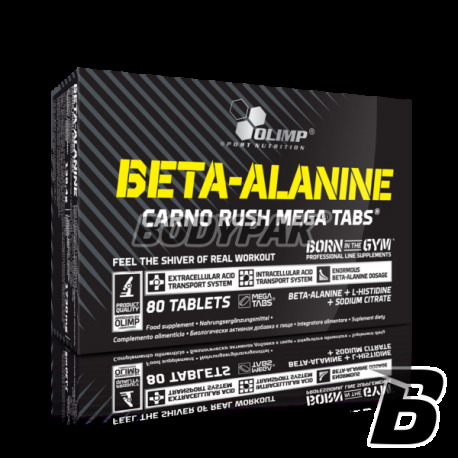 OLIMP Beta-alanine Carno Rush can contribute to increase the strength about training, finally accelerating the development of muscle mass and an increase in the rate of fat burning! Ingredients: 57.8% beta alanine, filler - microcrystalline cellulose; 8.7% sodium citrate, thickener - hydroxypropyl methylcellulose, sodium carboxymethylcellulose crosslinked; 2.9% l-histidine hydrochloride, anti-caking agent - silicon dioxide, magnesium salts of fatty acids, pyridoxine hydrochloride - vitamin B6. Trenuję Crossfit i produkt ten zdecydowanie zwiększa moje możliwości siłowo-wytrzymałościowe w trakcie treningu. Nie zamieniłbym go na żaden inny!